With the withdrawal of the fundamental rights petitions in the Court of Appeal against the delimitation gazette, the holding of the local government elections has now become almost a certainty. 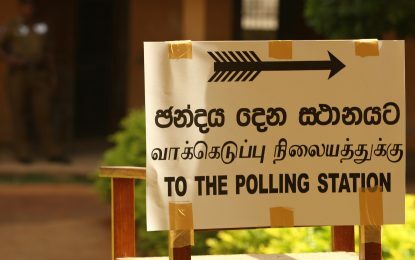 Nearly two years of delay has been attributed to both genuine efforts to complete much wanted election reforms as well as attempts to postpone elections till the anticipated settlement of the major rift in the SLFP. Although, the inordinate delay cannot be justified, the electoral reforms which introduced a mix of 60 percent first-past-the-post and 40 percent PR which ensures a representative for each electoral ward is a salutary measure. Delimitation of wards to accommodate the demographic changes that have taken place after the wards were carved out several decades ago was also an important development. Moreover, the reform of the electoral system was one of the main objectives of the national unity government and thus the time genuinely taken for completion of that part of the reform is well justified. The efforts to patch up the differences between the two warring factions of the SLFP – the official SLFP led by President Maithripala Sirisena and the Joint Opposition led by Former President Mahinda Rajapaksa – also is understandable because, if succeeded, that would prevent a humiliating defeat for the party. A defeat would certainly be a bad experience for a political party led by the country’s President who has maintained a reasonable level of popularity both nationally and internationally. Those who were behind the reconciliatory moves from the Sirisena group would have thought that an electoral defeat for the party would mean a greater shift of the party membership towards the Former President, making it difficult for President Sirisena to keep his grip over the party. At the same time such a defeat would also mean a bad omen for some of the SLFP cabinet ministers who have been half-heartedly remaining in the government, while having secret links with the Joint Opposition. Worst of all, some of them are defeated candidates or who have crossed over to the government after the change of government and accommodated as MPs on the national list. Naturally, they have the worst fears about the future and their only intention is to remain in power for few more years. There are people with similar issues on the Joint Opposition as well. Most of them have pending FCID inquiries or court cases against them and have no political future on their own. For their very survival they have no alternative other than depending on the residual popularity of Former President Mahinda Rajapaksa as the war winning national leader. However, for President Sirisena, it’s not the end of the world. For him there are many options including working further with the UNP to accomplish the remaining goals of the National Unity Government. They include the complete resolution of the national issue and carrying out the remaining economic and other reforms. In fact, one should not forget that most of the international support and recognition for him, is with the expectation that he will deliver these goals brining about the much needed economic transformation. Fulfillment of these expectations is sure to make him an unforgettable national leader who will also enjoy the support of the minorities. And that would give him a special status independent of the electoral success of his party and he could even become the President and Head of State for another term, probably through a vote in the parliament, though minus some of the executive powers he enjoys at present. On the other hand, President Sirisena must surely be aware that joining hands with the Joint Opposition would mean electoral success at the local level, but could be suicidal for him at national level particularly with the prospects of Mahinda Rajapaksa faction taking over the control of the SLFP. The unsuccessful dialogue between the two factions and some of the impossible demands made by the leaders of these groups and the fact that some of their leading members publicly opposed unity talks, also showed that there was no genuine desire to join together. Despite these developments the current situation is that elections are likely to be held simultaneously throughout the country under the new system as planned earlier, though there can be a slight delay with dates being pushed to somewhere early February. The UNP is like to gain out of the rift in the SLFP, at the same time it is not easy for the Mahinda Rajapaksa backed Sri Lanka Podu Jana Peramuna (SLPP) also to make a major impact. The past experience shows that it is not easy for a breakaway group from a main stream party to succeed in politics. It is likely that the political heat will be over with the conclusion of the election, whatever its outcome may be. With the threat from the breakaway group subsiding, the official SLFP will be able to determine its future direction. One cannot even rule out the possibility of the two parties in the unity government forming joint governments in some local authorities as well. Though, a local level election it will be an important mid-term election which in reality be a referendum on the future direction of party politics in the country. The people will see the real electoral strength of each party, independent of the outward manifestations often seen in the form of disproportionate noise and protest campaigns.